I loaned my regular ballet skirt to my teacher because she is using simple exercise wear for a beginner pointe demonstration for the older girls for a weekend dance concert they're in. I decided in the interim I would invoke Sewing Goal #2 from my Day 7 blog entry (the one about finishing projects started already and languishing). Here I've chopped 1.5 inches width of knit fabric in a strip 78 inches long - once the long strip and the short strip are sewn together. This is the skirt piece I cut a long time ago, and even hemmed already. Just needs for me to make a tie so the skirt can be worn. I think the fabric is pretty. You feed the strip through the little bias tape maker. I used my medium sized one. Iron was nearby to coax the folds into their proper place. After you've folded the bias tape over (making double folded bias tape), you painstakingly pin the long skinny tie to the top of your skirt, sandwiching the raw edge in between the two folds of the bias tape tie. Done! And now my dummy is wearing it. Incidentally, I got this dummy for Christmas. I don't have a name for her/it yet. Will have to think about it. 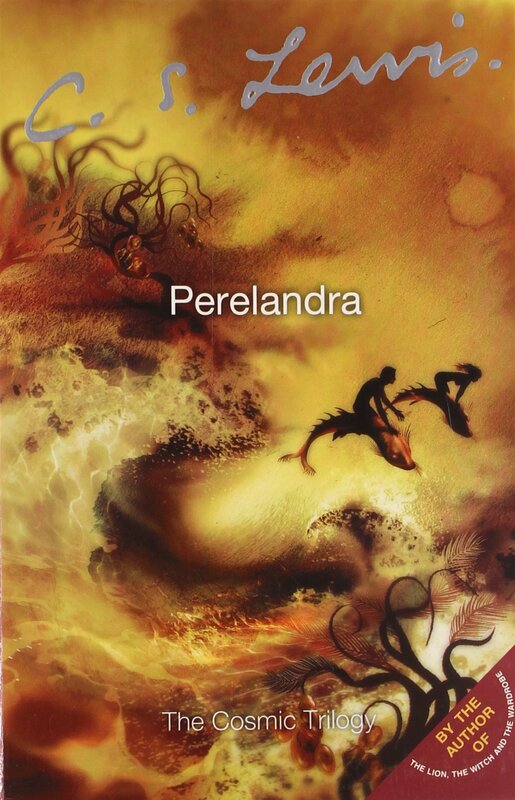 My son and I are now reading this book together: Perelandra. It is the second in The Cosmic Trilogy by C. S. Lewis. It's interesting because the narrator in this story is named Lewis. As everyone knows, C. S. Lewis is the author of the Narnia series and Mere Christianity, among many other books. A few years ago I read Out of the Silent Planet (book one in this series) to all four of my kids and Mark remembers the story. That's a good thing because he's my youngest and so I'll assume the older siblings remember some parts of the story for their part too. Excerpt: 1 Cor chap 1 vs 18, 19 For the word of the cross is folly to those who are perishing, but to us who are being saved it is the power of God. For it is written, "I will destroy the wisdom of the wise, and the discernment of the discerning i will thwart."